Four multimillion-dollar bathrooms awaiting installation along Rockaway Beach and Brighton Beach have had round-the-clock security guarding them since they were delivered in the summer, angering local residents who say the bathrooms are a waste and the city's priorities are wrong. 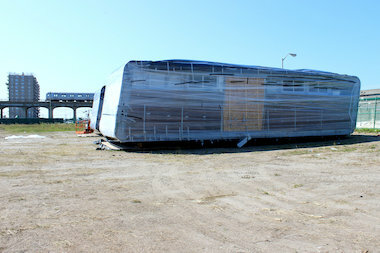 The high-priced structures, which were among 35 bathrooms and lifeguard stations provided after Hurricane Sandy by the Department of Design and Construction, have been under watch since they were delivered by barge in July. The city has only given a vague timeline for when these four bathrooms would be put in place.